A cascode amplifier normally use a pair of small power triodes to obtain high levels of gain and sensibility. The two triodes is usually of the same type. High transconductance triodes are more recommended, but types as ECC82 is normally used. 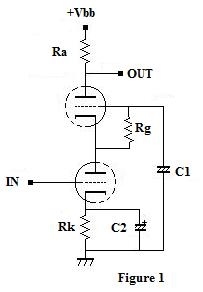 The circuit use one triode working as signal amplifier in the input and other triode as common base as output. 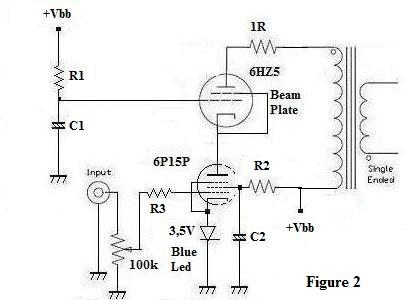 ( figure 1) This common base stage have a good current gain and a unitary voltage gain. But the power gain is reasonable. Thinking about this configuration, I verified a good quality for use in power amplifiers: the stage have high impedance in input and output. My idea is to use this circuit as class A2 output , but the circuit can work as class A1 output , too. I go to explain the use in A2 class, but for A1 class the circuit principle is seemed. 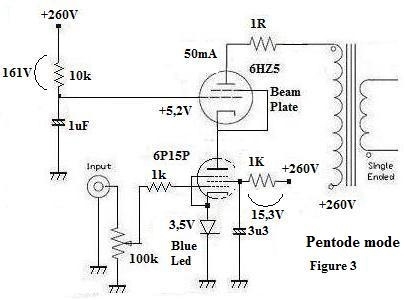 Is possible to use a high transcondutance triode in the lower position, but it need support a large cathode current( 50mA or more). 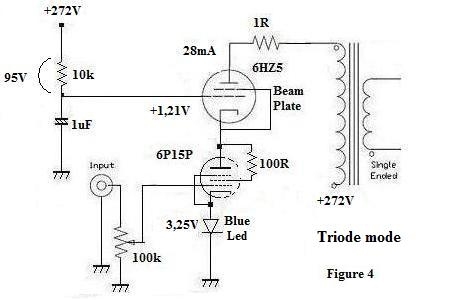 Two triodes in parallel can work fine supplying more current to up triode. I prefer the triode mode, and in this case the power is reduced, and you can need a pre-amplifier stage, but with a bigger power supply voltage( 500V, per example), the power is very good. A great advantage of this circuit is that the coupling between the input tube and the output tube is direct, without capacitors. Another advantage is that the signal passes of first tube to second, of the plate of down tube for the cathode of up tube, without suffering great limitations from excursion of the signal. I like of the Power Cascode sound for A2 stages. This stage have a best sound when compared a Cathode follower stage, for my ears. I did not make tests with a indirect triode In the up position, but I believe possible. For more informations, contact me.